J Hiebert, Q Shen, J Pierce. Application of Coenzyme Q10 in Clinical Practice. The Internet Journal of Internal Medicine. 2012 Volume 9 Number 2. Coenzyme Q10 (CoQ10) is naturally produced by the body and is an important factor in aerobic cellular respiration. This substance plays key roles in cellular energy production in mitochondria and is a potent antioxidant. The productivity of CoQ10 declines during the aging process. The heart, liver and kidneys have the highest energy requirements, thus these organs have the highest concentrations of CoQ10. Significant decreases in levels of CoQ10 are observed in various diseases such as diabetes, congestive heart failure, myocardial infarction, and cancer. Emerging evidence supports that administration of CoQ10 may have beneficial effects at the mitochondrial level. This review will emphasize the cellular mechanisms of CoQ10 and the administration of CoQ10 in different clinical disease states. The Uniformed Services University of the Health Sciences (USU), 4301 Jones Bridge Rd., Bethesda, MD 20814-4799 is the awarding (grant number: HU0001-11-1-TS09) and administering office. This research was sponsored by the TriService Nursing Research Program, Uniformed Services University of the Health Sciences; however, the information or content and conclusions do not necessarily represent the official position or policy of, nor should any official endorsement be inferred by, the TriService Nursing Research Program, Uniformed Services University of the Health Sciences, the Department of Defense, or the U.S. Government. Coenzyme Q10 is a lipid-soluble substance that is naturally produced by all cells in the human body. In 1957 Drs. Crane and Morton isolated the molecule subsequently identified as CoQ10, and in the following year, its chemical structure was determined by Dr. Karl Folkers and associates at Merck.1 In the next decade international research identified two significant attributes of CoQ10: its critical role in the electron transport system, and powerful antioxidant properties. Coupled with the commercial production of CoQ10, and its availability over-the-counter, the ever expanding knowledge of physiologic & pathophysiologic processes has produced widespread interest, research, and usage of CoQ10. The purpose of this article is to: 1) review the anatomy of the mitochondria and the roles of CoQ10 in mitochondria bioenergetics and its antioxidant property; 2) present evidence of its clinical usages in various diseases/conditions, including diabetes, congestive heart failure, acute myocardial infarction reperfusion injury, statin therapy, cancer, and migraine. The structure of a mitochondrion is unique as it contains two double-layer phospholipid membranes.11 Figure 1 presents the structural characteristics of a mitochondrion and illustrates CoQ10 or ubiquinone. The two double-layer phospholipid membranes are the outer and inner membrane respectively, which are embedded with proteins and enzymes. Similar to the membranes of other organelles, the outer membrane of the mitochondrion encloses the whole organelle. Relatively large internal channels are formed by many integral proteins in the outer membrane to allow passage of molecules. Distinguished from the outer membrane, the mitochondrial inner membrane forms many folds known as cristae. The surface area of the inner membrane is increased substantially, thus enhancing the productivity of cellular respiration. The outer and inner membranes divide the mitochondrion into two compartments, the intermembrane space and the mitochondrial matrix. The area between the outer and inner membranes is called the intermembrane space. The mitochondrial matrix is the compartment enclosed by the inner membrane. There are various enzymes, mitochondrial ribosomes, deoxyribonucleic acid (DNA), and granules within the matrix. Coenzyme Q10 or ubiquinone is located on the electron transport chain in the inner membrane, a key component in adenosine triphosphate (ATP) production. Figure 1. Anatomic Structure of a Mitochondrion Illustrating Ubiquinone (Coenzyme Q10). The uniqueness of the mitochondrion in the cells result from its essential function in the survival and apoptosis of cells.12 Adenosine triphosphate, the primary molecular energy required for vital organs like the brain, heart, lungs, skeletal muscles, and kidneys, is mainly generated in the mitochondria by converting digested nutrients such as proteins, lipids, and carbohydrates via oxidative phosphorylation. Oxidative phosphorylation begins when carbohydrates are metabolized into glucose and then into pyruvate in the cytoplasm via glycolysis. The pyruvate is transported into the mitochondrion and formed into acetyl CoA where it enters the citric acid cycle, resulting in NADH and FADH2. This process decreases equivalents utilized for transporting electrons. Figure 2 demonstrates the key roles of CoQ10 in mitochondrial bioenergetics and mitochondrial ROS reduction involving the five mitochondrial complexes (I, II, III, IV, and V) in the electron transport chain. As shown in Figure 2, the electron transport chain is located on the mitochondrial inner membrane. Complexes I and II are the sites for oxidation of NADH and FADH2, respectively. Coenzyme Q10 is located between complexes I, II and III, and functions as an electron transporter. Electrons generated during oxidation are transported by CoQ10 from complexes I and II to complex III. In complex III, electrons are transferred to cytochrome c. In complex IV, oxygen receives electrons from cytochrome c, generating water. An electrochemical gradient is created during electron transport as the protons being pumped across the inner membrane into the intermembrane space from the matrix. At complex V, ATP synthase utilizes the energy from the electrochemical gradient to condense a molecule of inorganic phosphate with adenosine diphosphate (ADP), resulting in generation of ATP. To fully utilize ATP, vital organs must have the capacity to adjust the ATP synthesis to meet metabolic requirements. In the heart, this is accomplished through an energy transfer process called the creatine kinase energy shuffle. During this mechanism, creatine kinase catalyzes the high-energy bond in ATP to form phosphocreatine. Smaller than ATP, phosphocreatine rapidly diffuses from the mitochondria to the myofibrils, whereby myofibrillar creatine kinase catalyzes the reformation of ATP from phosphocreatine. Functioning as an energy buffer, the levels of phosphocreatine decreases when cardiac metabolic demands increase, maintaining ATP levels. Figure 2. Key roles of CoQ10 in mitochondrial bioenergetics and mitochondrial ROS reduction. CoQ10: coenzyme Q10; ROS: reactive oxygen species; ATP: adenosine triphosphate; ADP: adenosine diphosphate; ANT: Adenine Nucleotide Translocase. As shown in Figure 2, mitochondrial ROS are also produced during electron transport and are natural byproducts of normal oxygen metabolism. Reactive oxygen species are a group of highly reactive molecules that contain oxygen and unpaired electrons. During the process of transporting electrons in the mitochondria, superoxide (O2 -) is generated as electrons are added to oxygen (O2). Superoxide is then converted by superoxide dismutase (SOD2) to hydrogen peroxide (H2O2), which can be further reduced to hydroxyl radicals (OH-).12 The extent of ROS formation can be significantly influenced by the functional activity of the mitochondria. For example, higher mitochondrial membrane potential and lower concentrations of ADP can lead to greater production of ROS. Hydroxyl radicals can directly and indirectly damage DNA, lipids, and proteins by oxidation. As the only endogenously synthesized lipid soluble antioxidant, the reduced form of CoQ10 (ubiquinol) can effectively protect not only lipids from peroxidation but also proteins from oxidation by reducing the initiating free radicals and preventing propagation. It can also interfere with DNA oxidation, especially mitochondrial DNA.13 The potent antioxidant property of ubiquinol presents a strong defensive mechanism against oxidative damage for all cells. With aging or various diseases, there is a significant decrease in either the biosynthesis of CoQ10 or its productivity in mitochondrial bioenergetics and scavenging ROS. Consequently, with low levels of CoQ10 there is a corresponding energetic deficiency and excessive formation of ROS with low levels of CoQ10. These abnormalities can be substantially ameliorated by exogenous CoQ10 supplementation. Excessive ROS can activate apoptotic pathways and lead to apoptosis or programmed cell death when too much damage is caused to its mitochondria.14 When the production of ROS exceeds the capacity of the antioxidant system to counterbalance, damage to protein, DNA, and lipids occurs. Oxidation of the mitochondrial outer membrane by ROS can induce mitochondrial dysfunction by destroying the membrane potential, leading to the release of cytochrome c from the mitochondria. The releasing of cytochrome c can initiate apoptotic pathway. There have been numerous clinical trials specifically examining CoQ10 in various diseases. Since the first clinical trials were first conducted approximately 45 years ago, about 3,450 (averaging about 77 per year) randomized clinical trials have been conducted world-wide relating CoQ10 to oxidative stress and/or cellular energetics. The quality of many of these clinical trials varies based upon design, subject selection, type of CoQ10, dosing, etc. Despite the abundant number of clinical trials, national clinical guidelines have not included CoQ10 in the armamentarium of therapy. There may be several reasons why CoQ10 may not be used in clinical practice. The first relates to the clinicians’ knowledge concerning the complexities of CoQ10 and the optimal dosage to be used with various diseases. The second relates to a communication barrier between research scientists and clinicians who provide patient care. The following section is a discussion of six disease processes/conditions that illustrates the current potential usage of CoQ10 in clinical medicine: Diabetes mellitus, congestive heart failure (CHF), reperfusion injury, statins, cancer, and migraine. There are two major types of CHF: 1) systolic heart failure and 2) diastolic heart failure. Systolic heart failure (SHF), which until recently was the predominant form of heart failure, occurs when there is decreased myocardial contractility, with the left ventricular ejection fraction < 50% and accompanying symptoms of pulmonary congestion. In diastolic heart failure (DHF), the left ventricular contractility is “normal” with ejection fraction ≥ 50%, but there is abnormal diastolic filling in the setting of symptomatic pulmonary congestion. There are many different underlying causes of SHF; the most prevalent cause in the U.S. is preceding myocardial injury from underlying coronary artery disease (CAD). Conversely, DHF is significantly more heterogeneous regarding the underlying pathophysiologic processes, including infiltrative, viral, hypertrophic, and inflammatory cardiomyopathies. Despite the varied underlying processes, the principle underpinning of DHF is impaired cellular energetics.30 Impairment of mitochondrial function in turn results in increased ROS, causing mitochondrial injury, which can further aggravate mitochondrial dysfunction. The current focus of DHF management is to reduce the risk factors such as diabetes, dyslipidemia, obesity, inactivity, and sleep apnea. However, these measures do not directly address the deficiency of cellular energetics. Molyneux et al. found that the serum CoQ10 level was an independent predictor of mortality in chronic heart failure patients. They reported that the optimal CoQ10 serum concentration was 0.73 µmol/l for prediction of mortality.35 Maes, et al. reported that lower CoQ10 levels were associated with depression, and increased risk for CAD and CHF.36 The low achieved CoQ10 level with oral doses of ubiquinone prompted Langsjoen & Langsjoen to administer ubiquinol, the reduced form of CoQ10, to seven patients with severe systolic dysfunction. The serum level increased from 1.6 µg/ml to 6.5 µg/ml, with an accompanied improvement of mean left ventricular ejection fraction (LVEF) from 22% to 39%.37 In that same year, Harinstein et al. demonstrated similar improvements in 11 patients who received micronutrients including CoQ10.38 All subjects had viable but hibernating myocardium whose mean LVEF improved from 17% to 59%. To further examine the effect of CoQ10 and other micronutrient supplements, Fumagalli et al. investigated the peak oxygen consumption in patients with stable CHF.39 The experimental group received CoQ10 and creatine supplements in this double blind randomized control trial. At 8 weeks, the experimental group had significantly increased peak oxygen consumption compared to the control group. A sentinel study published by Singh et al., in 1998 compared patients with acute myocardial infarction/acute coronary syndrome who were treated with reperfusion therapy using streptokinase. In this double-blinded study, patients received either B complex vitamins or CoQ10. They found that CoQ10 significantly reduced angina pectoris, reduced dysrhythmias, and improved left ventricular function. Thus, they concluded that CoQ10 could be a rapid protective substance to administer to patients within 3 days of acute myocardial infarction.50 Since this study, there has been no new research specifically on CoQ10 in myocardial infarction patients. However, the research has shifted to investigate ischemic-reperfusion injury and the usage in revascularization surgery patients. A migraine is a neurological condition in which a person experiences recurrent headaches that often lead to intense throbbing of the head, nausea, vomiting, and photophobia.62 Migraine attacks may occur for hours to days causing significant pain. Recently, they have discovered a link between migraines and mitochondrial function. When there are variants (polymorphisms) in mitochondrial proteins it can adversely affect oxidation phosphorylation of the cell and thus alter the energy metabolism.63 Since CoQ10 is an essential component of the electron transport chain, it may play an important role in the prevention and treatment of migraines. Studies have shown that migraine patients treated with CoQ10 have a significant reduction in the number of days with migraine headaches64 and frequency of headaches.65, 66 A study by Boles et al.67 found that CoQ10 was an effective treatment for cyclic vomiting syndrome which many migraine patients experience. Several of the migraine studies involving CoQ10 have focused on reducing pain and symptoms of pediatric and adolescent patients.65, 68 A number of the clinical studies related to CoQ10 supplementation for migraines include other combinations of substances such as L-carnitine,69 riboflavin,70 and magnesium.71 CoQ10 at various dosages is an effective prophylaxis treatment for migraines.72, 73 Future placebo-controlled trials using migraine patients are needed to determine the optimal frequency, dosage and usage of CoQ10. As with any drug or nutrient being investigated, there are often studies that demonstrate that the substance is not effective. Thus, in the literature investigations have shown that CoQ10 is not therapeutic for various diseases and conditions. However, many times these studies have great variation in experimental design, subject selection, dosage, CoQ10 formulation and method of evaluation. Yet, the overwhelming data support the usage of CoQ10 in clinical practice. A study by Khatta et al. found in CHF patients that CoQ10 did not affect ejection fraction, peak oxygen consumption, or exercise duration.74 This was a randomized, double-blind, placebo-controlled trial to investigate the effects of oral CoQ10 (200 mg/d). In this study, 46 subjects with systolic dysfunction were given CoQ10 for 6 months. These researchers found in treatment subjects (mean age = 67 years) the mean serum CoQ10 concentration increased from 0.95 ± 0.62 µg/mL to 2.2 ± 1.20 µg/mL. There are several issues with this study. For example, the standard deviation in the serum CoQ10 was relatively large, which could indicate that the effective dose of CoQ10 at 200 mg/d was subtherapeutic. This could have been related to the type of oral CoQ10 administered in the study since the mean age of the subjects was 67 years old. In other words, the investigators used ubiquinone versus ubiquinol which has greater absorption in older patients. Hence, this could be the reason why the researchers did not observe any effect of oral CoQ10 in this sample. Coenzyme Q10 is an essential factor in mitochondrial bioenergetics, playing a crucial role in transporting electrons in the mitochondria respiratory chain. Additionally, CoQ10 is a highly efficient antioxidant that prevents damage to DNA, proteins, and lipids. Though CoQ10 is naturally produced by all cells in the body, the aging process and various diseases or pathological mechanisms can disrupt the biosynthesis, leading to CoQ10 deficiency. Dietary supplementing of CoQ10 (either ubiquinone or ubiquinol) has promising beneficial effects in a wide variety of diseases and pathophysiologic conditions. The addition of CoQ10 in clinical practice to traditional treatments can lead to improved patient outcomes. 1. Crane FL: The evolution of coenzyme Q. Biofactors; 2008; 32(1-4): 5-11. 2. Littarru GP and Tiano L: Bioenergetic and antioxidant properties of coenzyme Q10: recent developments. Mol Biotechnol; 2007; 37(1): 31-7. 3. De Cabo R, Cabello R, Rios M, Lopez-Lluch G, et al. : Calorie restriction attenuates age-related alterations in the plasma membrane antioxidant system in rat liver. Exp Gerontol; 2004; 39(3): 297-304. 4. Navarro F, Villalba JM, Crane FL, Mackellar WC, and Navas P: A phospholipid-dependent NADH-coenzyme Q reductase from liver plasma membrane. Biochem Biophys Res Commun; 1995; 212(1): 138-43. 5. Barshop BA and Gangoiti JA: Analysis of coenzyme Q in human blood and tissues. Mitochondrion; 2007; 7 Suppl: S89-93. 6. Kumar A, Kaur H, Devi P, and Mohan V: Role of coenzyme Q10 (CoQ10) in cardiac disease, hypertension and Meniere-like syndrome. Pharmacol Ther; 2009; 124(3): 259-68. 7. Singh U, Devaraj S, and Jialal I: Coenzyme Q10 supplementation and heart failure. Nutr Rev; 2007; 65(6 Pt 1): 286-93. 8. Sourris KC, Harcourt BE, Tang PH, Morley AL, et al. : Ubiquinone (coenzyme Q10) prevents renal mitochondrial dysfunction in an experimental model of type 2 diabetes. Free Radic Biol Med; 2012; 52(3): 716-23. 9. Hodgson JM, Watts GF, Playford DA, Burke V, and Croft KD: Coenzyme Q10 improves blood pressure and glycaemic control: a controlled trial in subjects with type 2 diabetes. Eur J Clin Nutr; 2002; 56(11): 1137-42. 10. Bahar M, Khaghani S, Pasalar P, Paknejad M, et al. : Exogenous coenzyme Q10 modulates MMP-2 activity in MCF-7 cell line as a breast cancer cellular model. Nutr J; 2010; 9: 62. 11. 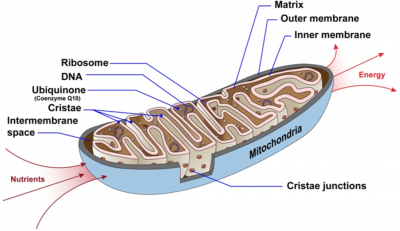 Cusimano EM, Knight AR, Slusser JG, Clancy RL, and Pierce JD: Mitochondria: the hemi of the cell. Adv Emerg Nurs J; 2009; 31(1): 54-62. 12. Svensson OL: Mitochondria: structure, functions and dysfunctions. (1st ed). 2011, Hauppauge, NY: Nova Science Pub Inc.
13. Bentinger M, Brismar K, and Dallner G: The antioxidant role of coenzyme Q. Mitochondrion; 2007; 7 Suppl: S41-50. 14. Cui H, Kong Y, and Zhang H: Oxidative stress, mitochondrial dysfunction, and aging. J Signal Transduct; 2012; 2012: 646354. 15. Navas P, Villalba JM, and de Cabo R: The importance of plasma membrane coenzyme Q in aging and stress responses. Mitochondrion; 2007; 7 Suppl: S34-40. 16. Quinzii CM and Hirano M: Coenzyme Q and mitochondrial disease. Dev Disabil Res Rev; 2010; 16(2): 183-8. 17. Sivitz WI and Yorek MA: Mitochondrial dysfunction in diabetes: from molecular mechanisms to functional significance and therapeutic opportunities. Antioxid Redox Signal; 2010; 12(4): 537-77. 18. Khullar M, Al-Shudiefat AA, Ludke A, Binepal G, and Singal PK: Oxidative stress: a key contributor to diabetic cardiomyopathy. Can J Physiol Pharmacol; 2010; 88(3): 233-40. 19. Tsuneki H, Sekizaki N, Suzuki T, Kobayashi S, et al. : Coenzyme Q10 prevents high glucose-induced oxidative stress in human umbilical vein endothelial cells. Eur J Pharmacol; 2007; 566(1-3): 1-10. 20. Figueroa-Romero C, Sadidi M, and Feldman EL: Mechanisms of disease: the oxidative stress theory of diabetic neuropathy. Rev Endocr Metab Disord; 2008; 9(4): 301-14. 21. Orsucci D, Mancuso M, Ienco EC, LoGerfo A, and Siciliano G: Targeting mitochondrial dysfunction and neurodegeneration by means of coenzyme Q10 and its analogues. Curr Med Chem; 2011; 18(26): 4053-64. 22. Santos JM, Mohammad G, Zhong Q, and Kowluru RA: Diabetic retinopathy, superoxide damage and antioxidants. Curr Pharm Biotechnol; 2011; 12(3): 352-61. 23. Qu J, Kaufman Y, and Washington I: Coenzyme Q10 in the human retina. Invest Ophthalmol Vis Sci; 2009; 50(4): 1814-8. 24. Feher J, Kovacs B, Kovacs I, Schveoller M, et al. : Improvement of visual functions and fundus alterations in early age-related macular degeneration treated with a combination of acetyl-L-carnitine, n-3 fatty acids, and coenzyme Q10. Ophthalmologica; 2005; 219(3): 154-66. 25. Blasi MA, Bovina C, Carella G, Genova ML, et al. : Does coenzyme Q10 play a role in opposing oxidative stress in patients with age-related macular degeneration? Ophthalmologica; 2001; 215(1): 51-4. 26. Kernt M, Hirneiss C, Neubauer AS, Ulbig MW, and Kampik A: Coenzyme Q10 prevents human lens epithelial cells from light-induced apoptotic cell death by reducing oxidative stress and stabilizing BAX / Bcl-2 ratio. Acta Ophthalmol; 2010; 88(3): e78-86. 27. Chen CC, Liou SW, Chen WC, Hu FR, et al. : Coenzyme Q10 reduces ethanol-induced apoptosis in corneal fibroblasts. PLoS One; 2011; 6(4): e19111. 28. Russo R, Cavaliere F, Rombola L, Gliozzi M, et al. : Rational basis for the development of coenzyme Q10 as a neurotherapeutic agent for retinal protection. Prog Brain Res; 2008; 173: 575-82. 29. Wang S, Zhang J, Jiang T, Zheng L, et al. : Protective effect of Coenzyme Q(10) against oxidative damage in human lens epithelial cells by novel ocular drug carriers. Int J Pharm; 2011; 403(1-2): 219-29. 30. Phan TT, The Pathophysiology of Heart Failure with Preserved Ejection Fraction, in School of Clinical and Experimental Medicine2010, University of Birmingham: Birmingham, England. p. 202. 31. Langsjoen PH and Folkers K: A six-year clinical study of therapy of cardiomyopathy with coenzyme Q10. Int J Tissue React; 1990; 12(3): 169-71. 32. Morisco C, Trimarco B, and Condorelli M: Effect of coenzyme Q10 therapy in patients with congestive heart failure: a long-term multicenter randomized study. Clin Investig; 1993; 71(8 Suppl): S134-6. 33. Munkholm H, Hansen HH, and Rasmussen K: Coenzyme Q10 treatment in serious heart failure. Biofactors; 1999; 9(2-4): 285-9. 34. Keogh A, Fenton S, Leslie C, Aboyoun C, et al. : Randomised double-blind, placebo-controlled trial of coenzyme Q, therapy in class II and III systolic heart failure. Heart Lung Circ; 2003; 12(3): 135-41. 35. Molyneux SL, Florkowski CM, George PM, Pilbrow AP, et al. : Coenzyme Q10: an independent predictor of mortality in chronic heart failure. J Am Coll Cardiol; 2008; 52(18): 1435-41. 36. Maes M, Mihaylova I, Kubera M, Uytterhoeven M, et al. : Lower plasma Coenzyme Q10 in depression: a marker for treatment resistance and chronic fatigue in depression and a risk factor to cardiovascular disorder in that illness. Neuro Endocrinol Lett; 2009; 30(4): 462-9. 37. Langsjoen PH and Langsjoen AM: Supplemental ubiquinol in patients with advanced congestive heart failure. Biofactors; 2008; 32(1-4): 119-28. 38. Harinstein ME, Berliner JI, Shah SJ, Taegtmeyer H, and Gheorghiade M: Normalization of ejection fraction and resolution of symptoms in chronic severe heart failure is possible with modern medical therapy: clinical observations in 11 patients. Am J Ther; 2008; 15(3): 206-13. 39. Fumagalli S, Fattirolli F, Guarducci L, Cellai T, et al. : Coenzyme Q10 terclatrate and creatine in chronic heart failure: a randomized, placebo-controlled, double-blind study. Clin Cardiol; 2011; 34(4): 211-7. 40. Dorn GW, 2nd and Diwan A: The rationale for cardiomyocyte resuscitation in myocardial salvage. J Mol Med (Berl); 2008; 86(10): 1085-95. 41. Lesnefsky EJ and Hoppel CL: Ischemia-reperfusion injury in the aged heart: role of mitochondria. Arch Biochem Biophys; 2003; 420(2): 287-97. 42. Verma DD, Hartner WC, Thakkar V, Levchenko TS, and Torchilin VP: Protective effect of coenzyme Q10-loaded liposomes on the myocardium in rabbits with an acute experimental myocardial infarction. Pharm Res; 2007; 24(11): 2131-7. 43. Lekli I, Das S, Mukherjee S, Bak I, et al. : Coenzyme Q9 provides cardioprotection after converting into coenzyme Q10. J Agric Food Chem; 2008; 56(13): 5331-7. 44. Perrelli MG, Pagliaro P, and Penna C: Ischemia/reperfusion injury and cardioprotective mechanisms: Role of mitochondria and reactive oxygen species. World J Cardiol; 2011; 3(6): 186-200. 45. Di Giovanni S, Mirabella M, Spinazzola A, Crociani P, et al. : Coenzyme Q10 reverses pathological phenotype and reduces apoptosis in familial CoQ10 deficiency. Neurology; 2001; 57(3): 515-8. 46. Niibori K, Wroblewski KP, Yokoyama H, Crestanello JA, and Whitman GJ: Bioenergetic effect of liposomal coenzyme Q10 on myocardial ischemia reperfusion injury. Biofactors; 1999; 9(2-4): 307-13. 47. Whitman GJ, Niibori K, Yokoyama H, Crestanello JA, et al. : The mechanisms of coenzyme Q10 as therapy for myocardial ischemia reperfusion injury. Mol Aspects Med; 1997; 18 Suppl: S195-203. 48. Julia PL, Buckberg GD, Acar C, Partington MT, and Sherman MP: Studies of controlled reperfusion after ischemia. XXI. Reperfusate composition: superiority of blood cardioplegia over crystalloid cardioplegia in limiting reperfusion damage--importance of endogenous oxygen free radical scavengers in red blood cells. J Thorac Cardiovasc Surg; 1991; 101(2): 303-13. 49. Tran TP, Tu H, Pipinos, II, Muelleman RL, et al. : Tourniquet-induced acute ischemia-reperfusion injury in mouse skeletal muscles: Involvement of superoxide. Eur J Pharmacol; 2011; 650(1): 328-34. 50. Singh RB, Wander GS, Rastogi A, Shukla PK, et al. : Randomized, double-blind placebo-controlled trial of coenzyme Q10 in patients with acute myocardial infarction. Cardiovasc Drugs Ther; 1998; 12(4): 347-53. 51. Donnino MW, Cocchi MN, Salciccioli JD, Kim D, et al. : Coenzyme Q10 levels are low and may be associated with the inflammatory cascade in septic shock. Crit Care; 2011; 15(4): R189. 52. Okello E, Jiang X, Mohamed S, Zhao Q, and Wang T: Combined statin/coenzyme Q10 as adjunctive treatment of chronic heart failure. Med Hypotheses; 2009; 73(3): 306-8. 53. Ashton E, Windebank E, Skiba M, Reid C, et al. : Why did high-dose rosuvastatin not improve cardiac remodeling in chronic heart failure? Mechanistic insights from the UNIVERSE study. Int J Cardiol; 2011; 146(3): 404-7. 54. Wyman M, Leonard M, and Morledge T: Coenzyme Q10: a therapy for hypertension and statin-induced myalgia? Cleve Clin J Med; 2010; 77(7): 435-42. 55. Shibata T, Shimozu Y, Wakita C, Shibata N, et al. : Lipid peroxidation modification of protein generates Nepsilon-(4-oxononanoyl)lysine as a pro-inflammatory ligand. J Biol Chem; 2011; 286(22): 19943-57. 56. Cooney RV, Dai Q, Gao YT, Chow WH, et al. : Low plasma coenzyme Q(10) levels and breast cancer risk in Chinese women. Cancer Epidemiol Biomarkers Prev; 2011; 20(6): 1124-30. 57. Sachdanandam P: Antiangiogenic and hypolipidemic activity of coenzyme Q10 supplementation to breast cancer patients undergoing Tamoxifen therapy. Biofactors; 2008; 32(1-4): 151-9. 58. Premkumar VG, Yuvaraj S, Sathish S, Shanthi P, and Sachdanandam P: Anti-angiogenic potential of CoenzymeQ10, riboflavin and niacin in breast cancer patients undergoing tamoxifen therapy. Vascul Pharmacol; 2008; 48(4-6): 191-201. 59. Hertz N and Lister RE: Improved survival in patients with end-stage cancer treated with coenzyme Q(10) and other antioxidants: a pilot study. J Int Med Res; 2009; 37(6): 1961-71. 60. Rusciani L, Proietti I, Rusciani A, Paradisi A, et al. : Low plasma coenzyme Q10 levels as an independent prognostic factor for melanoma progression. J Am Acad Dermatol; 2006; 54(2): 234-41. 61. Conklin KA: Coenzyme q10 for prevention of anthracycline-induced cardiotoxicity. Integr Cancer Ther; 2005; 4(2): 110-30. 62. Rapoport AM and Bigal ME: Migraine preventive therapy: current and emerging treatment options. Neurol Sci; 2005; 26 Suppl 2: s111-20. 63. Zaki EA, Freilinger T, Klopstock T, Baldwin EE, et al. : Two common mitochondrial DNA polymorphisms are highly associated with migraine headache and cyclic vomiting syndrome. Cephalalgia; 2009; 29(7): 719-28. 64. Rozen TD, Oshinsky ML, Gebeline CA, Bradley KC, et al. : Open label trial of coenzyme Q10 as a migraine preventive. Cephalalgia; 2002; 22(2): 137-41. 65. Hershey AD, Powers SW, Vockell AL, Lecates SL, et al. : Coenzyme Q10 deficiency and response to supplementation in pediatric and adolescent migraine. Headache; 2007; 47(1): 73-80. 66. Sandor PS, Di Clemente L, Coppola G, Saenger U, et al. : Efficacy of coenzyme Q10 in migraine prophylaxis: a randomized controlled trial. Neurology; 2005; 64(4): 713-5. 67. Boles RG, Lovett-Barr MR, Preston A, Li BU, and Adams K: Treatment of cyclic vomiting syndrome with co-enzyme Q10 and amitriptyline, a retrospective study. BMC Neurol; 2010; 10: 10. 68. Slater SK, Nelson TD, Kabbouche MA, LeCates SL, et al. : A randomized, double-blinded, placebo-controlled, crossover, add-on study of CoEnzyme Q10 in the prevention of pediatric and adolescent migraine. Cephalalgia; 2011; 31(8): 897-905. 69. Boles RG: High degree of efficacy in the treatment of cyclic vomiting syndrome with combined co-enzyme Q10, L-carnitine and amitriptyline, a case series. BMC Neurol; 2011; 11: 102. 70. D'Andrea G, Bussone G, Allais G, Aguggia M, et al. : Efficacy of Ginkgolide B in the prophylaxis of migraine with aura. Neurol Sci; 2009; 30 Suppl 1: S121-4. 71. Esposito M and Carotenuto M: Ginkgolide B complex efficacy for brief prophylaxis of migraine in school-aged children: an open-label study. Neurol Sci; 2011; 32(1): 79-81. 72. Modi S and Lowder DM: Medications for migraine prophylaxis. Am Fam Physician; 2006; 73(1): 72-8. 73. Schurks M, Diener HC, and Goadsby P: Update on the prophylaxis of migraine. Curr Treat Options Neurol; 2008; 10(1): 20-9. 74. Khatta M, Alexander BS, Krichten CM, Fisher ML, et al. : The effect of coenzyme Q10 in patients with congestive heart failure. Ann Intern Med; 2000; 132(8): 636-40.